With exams right around the corner, it's now time for students to start thinking about taking charge of their own revision. To ensure your pupils don't get off on the wrong foot, we’ve gathered a range of supportive resources to help them seamlessly transition from structured revision in the classroom to meaningful study at home, all of which can be found on our GCSE revision collection. Revision set based on the Articulate board game. Includes board, deck of cards, and instruction power point. 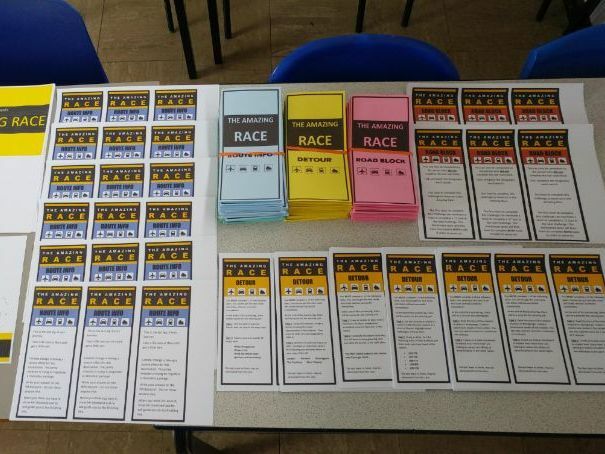 This is my Second Amazing Race for GCSE revision. It covers topics such as Rainforests, River processes and Volcanoes. Every location has 2 tasks - these tasks include GCSE questions, creative and recall tasks. A revised version of the board game 'Articulate' - the word describing game. This one is designed for revision of keywords for my Year 8. Templates and playing cards can be amended for any topic and year group. 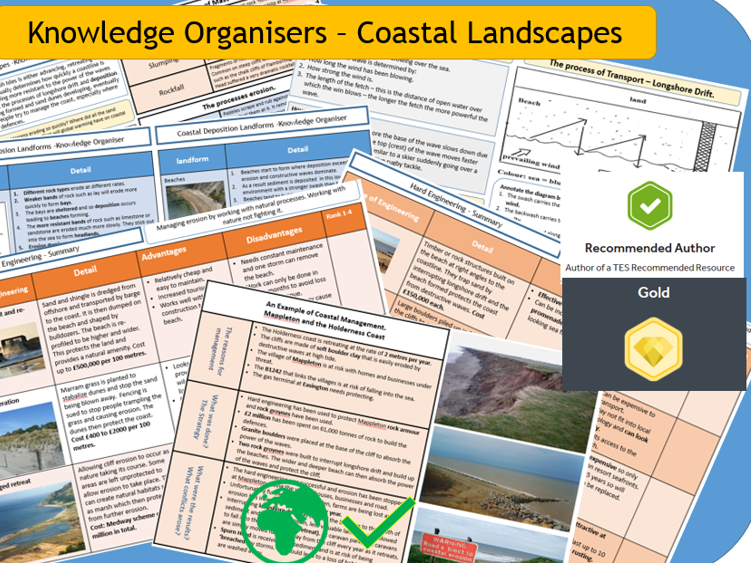 Knowledge organisers for all the different topics in the AQA 9-1 GCSE geography course. Notes: Please check organisers before printing on mass for simple errors (only human) or changing case study information. GCSE Glaciation: Knowledge Organisers and Revision Summaries. A knowledge organiser for the AQA human and physical fieldwork. The human is based around tourism in Swanage and the physical is focused on managing longshore drift along the Swanage coastline. They could be easily adapted to your own chosen fieldwork sites. GCSE Coastal Landscapes AQA 9-1 -Knowledge Organisers and Revision Summaries. A series of concise summaries that cover the key content of the new 9-1 GCSE for AQA. The whole coastal section is covered. 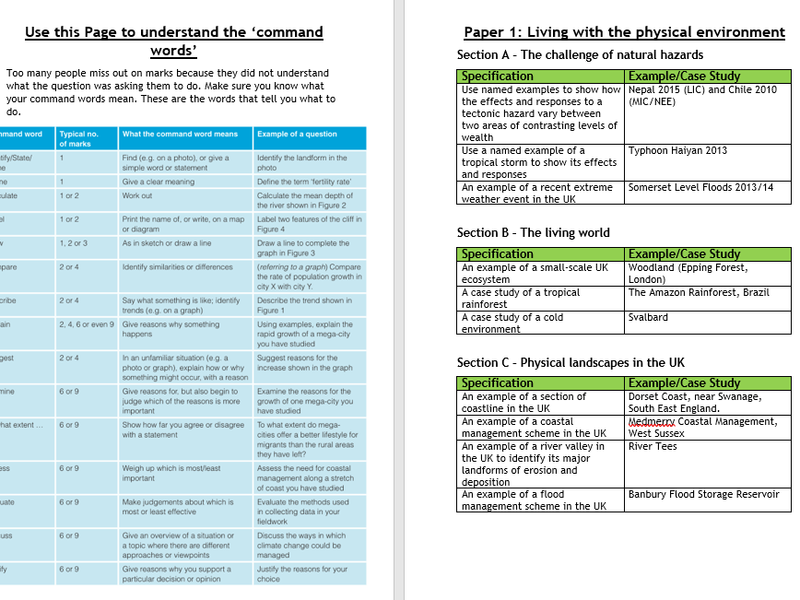 These summaries can easily be incorporated singly into existing lessons or combined into a summary booklet for revision. Covers the processes, landforms and management elements of the syllabus. Fully editable it can be easily adapted to suit your needs or simply printed off and used for revision. A one page 'true' knowledge organiser has also been included that is useful for planning the unit. As a thank-you, if you leave a review, please choose another single resource for free from my shop, either PM me or use e-mail (see the last slide of the power-point). 'Become the Examiner' Resources come in two parts. A worksheet gives students the chance to practise answering an example examination question. A presentation then allows students to look at sample top, middle and bottom level answers along with annotations that justify the examiner's marks. Good exam practices as well as common errors are highlighted. This 'Become the Examiner' looks at how we describe and measure birth rates. Contains information on examples and case studies. Contains structured exam practice for each example and case study. Created using inspiration from MrsHumanities, AQA sample material, Oxford University Press textbooks, Hodder Education textbooks and CGP. New AQA 9-1 GCSE Geography revision work booklets. Topics; Urban; Economic World; RM; Rivers and coasts. I have included both the PDF versions and PPT versions so that it can be easily adapted to suit your own case studies/topics. Each booklet is designed to be used as homework or intervention. 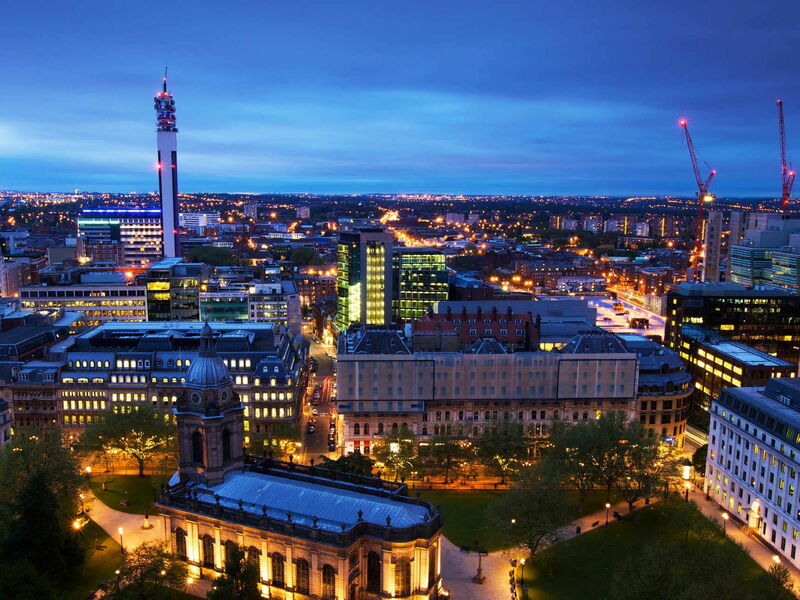 60 exam questions - 10 exam questions for each of the following topics - Population Dynamics, Consuming Resources, Globalisation, Development Dilemmas, Changing Economy of the UK & Challenges of an Urban World. Examples of 2, 4, 6 & 8 mark questions. 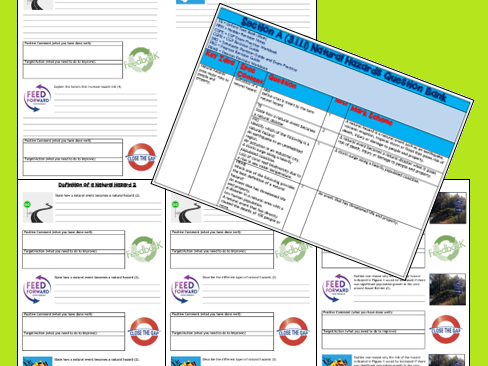 Questions are laid out so they can be easily printed out and given to students as homework or revision tasks. 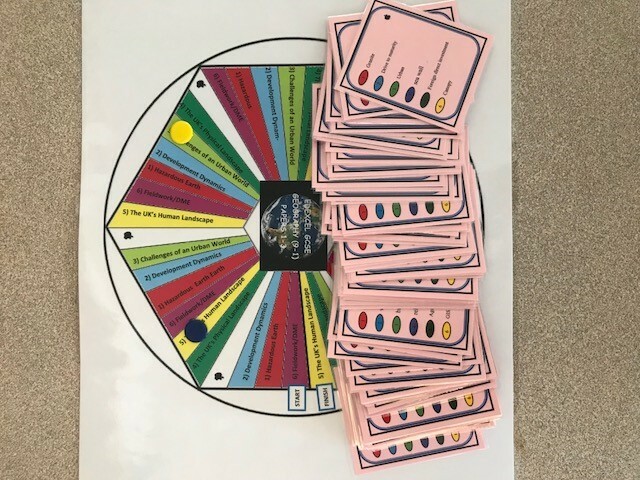 A command word wheel, which allows students to spin the wheel and find the definition and starter sentences for each command word for examination questions they may be answering. 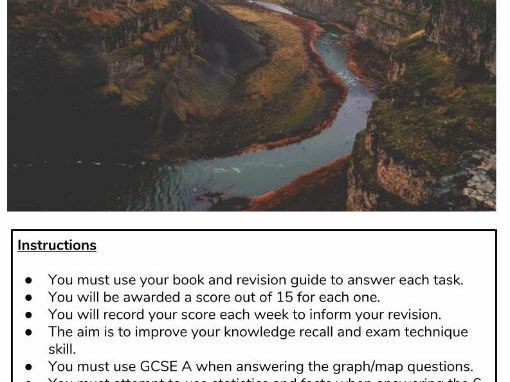 This is a revision companion guide linked with the 'CGP GCSE AQA Geography 9-1 Course' book. The booklet contains personal learning checklists, keywords and exam practice questions. It also contains suggestions for revision techniques and 'top tips' for the exam. However the booklet can be easily adapted to add in/take out sections. The booklet also links in with GCSE Pod with suggested videos and video playlists. Pupils find this guide extremely useful to help structure their revision and help give them a starting point. It's also good for them to have something to work through ticking off as they go tracking their own progress. It really helped with motivation for outside of school revision. See Unit 2 (Human Paper) Booklet as well! Revision style bookmarks covering all areas of the EdExcel A GCSE 1-9 changing cities topic. These bookmarks condense all information into easily digestible sections to help students prepare for the changing cities topic. This worksheet has questions about types of rock and the the rock cycle. It assumes that pupils already have a basic knowledge so is good for revision or maybe for stretching more able pupils in a basic lesson. 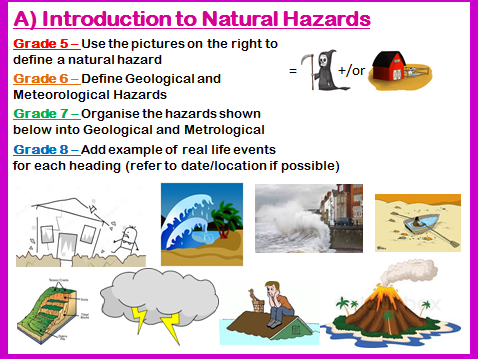 A range of skills activities for the new 9-1 GCSE Geography. Most resources are taken from AQA and OCR. Will add more over time. 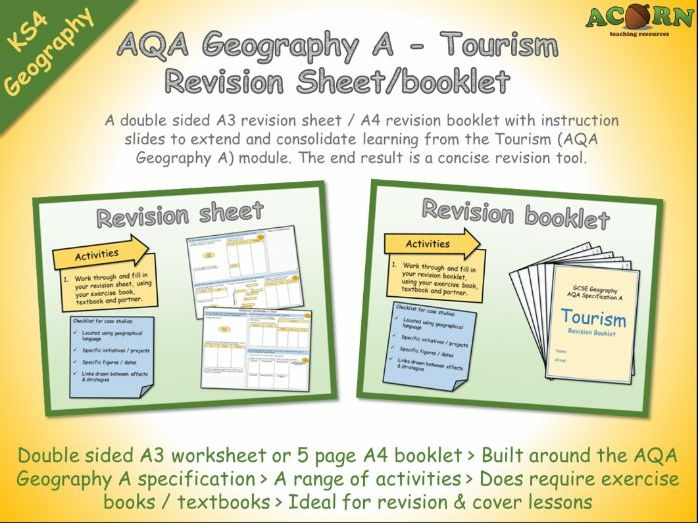 A double sided A3 revision sheet / A4 revision booklet with instruction slides to extend and consolidate learning from the Tourism (AQA Geography A) module. The end result is a concise revision tool. To revise and extend learning from the module by working through a structured revision sheet. 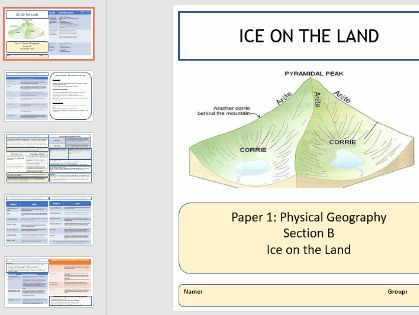 The sheet has been built around the outgoing AQA geography A specification. Tourism is a case study heavy module, so the revision material has ended up with a lot of tables to simplify the key ideas. Model examples and provide support. Break down into timed sections to allow progress checks. Students should be encouraged to draw links between sections. I use this before the module exam. Use to practise answering some exam questions. A faced paced containing tasks to complete on tables. All resources included. Tasks will help pupils revise tectonics, climate change, extreme weather in the UK and tropical storms. Please check out my other revision lessons and leave feedback if you like the lesson!